What Dental Implant Problems Can Develop Without Care? Mucositis – An inflammation of the soft tissue surrounding a dental implant, the symptoms of mucositis include bleeding of the gums. If mucositis is detected early, current scientific evidence suggests that it may be successfully treated and reversed. 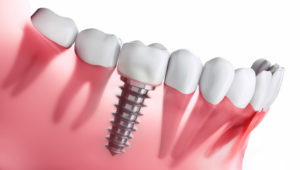 Peri-Implantitis – If mucositis is not treated early enough it progresses to bone loss, also known as peri-implantitis. Unfortunately, the bone loss is not reversible. If peri-implantitis is not treated it can lead to more advanced bone loss and may require your implant to be removed. Inter-dental brushes designed to remove plaque from between the teeth on either side of the implant. Disclosing tablets that use staining to show where plaque has accumulated in your mouth. With proper care, dental implants can be an effective and aesthetically pleasing solution for replacing missing teeth. Just follow the tips above for a healthy and whole smile that will last a lifetime! A proud member of the Florida Prosthodontic Association, Dr. Matthew Nawrocki is dedicated to helping patients in Orange Park maintain healthy and complete smiles. As a specialist in prosthodontics, Dr. Nawrocki has expert knowledge and experience when it comes to dental implants and other tooth replacement treatment options. Patients interested in learning more about ways to fill in gaps in their teeth can contact Dr. Nawrocki at this website or by calling the office at 904-272-1588.